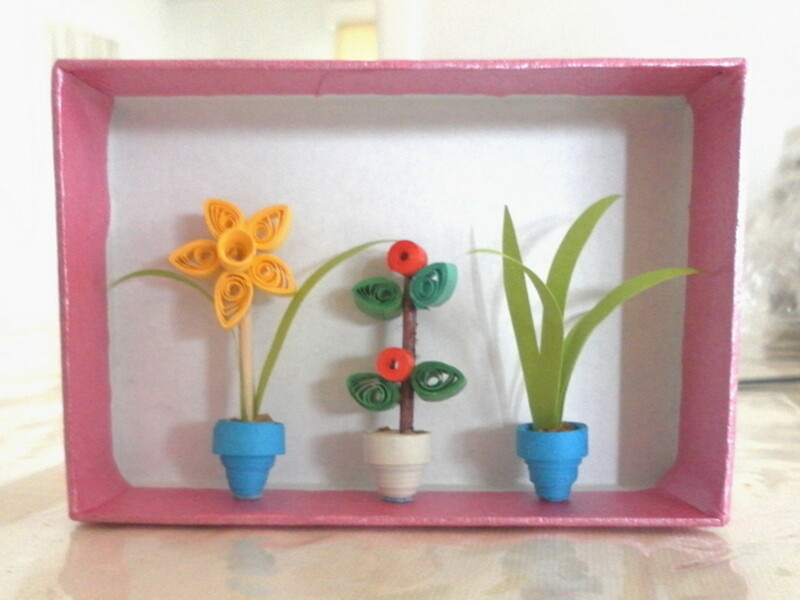 Paper quilling designs are commonly used in crafts and decorations. 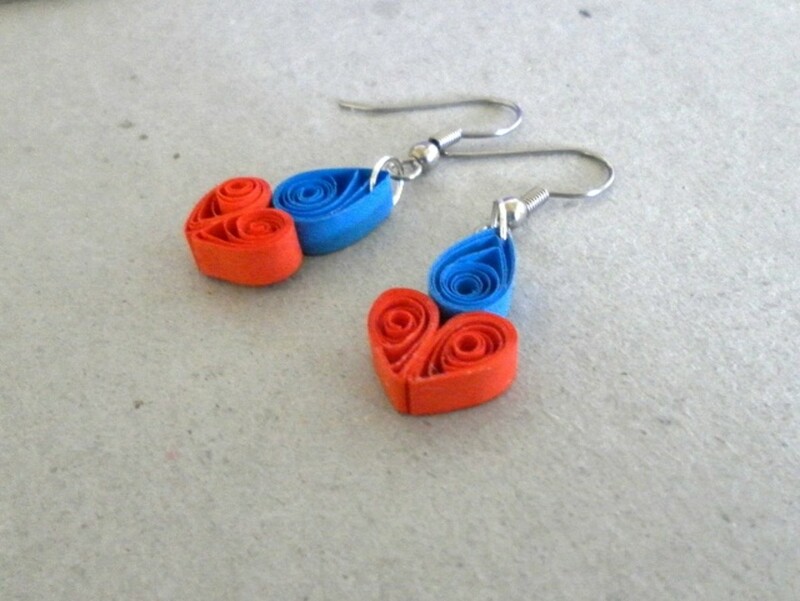 But there's more to paper quilling artwork, the quilled items are now popularly used as fashion accessories like earrings, rings and pendants. These paper quilled accessories are carefully handcrafted and they look very intricate and unique. 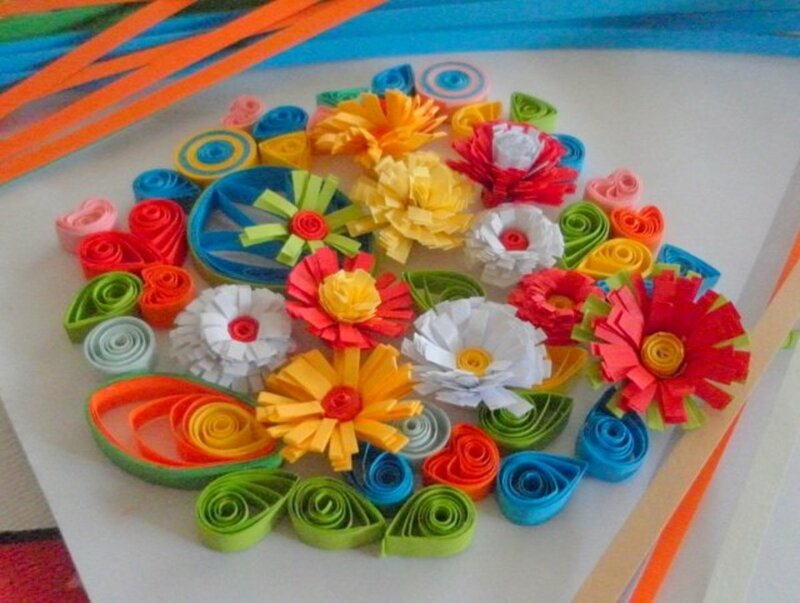 If you have yet to learn paper quilling, there are step-by-step instructions for basic quilling shapes in these tutorials: Basic Techniques, Shapes and Designs and Comb Techniques, Shapes and Designs. 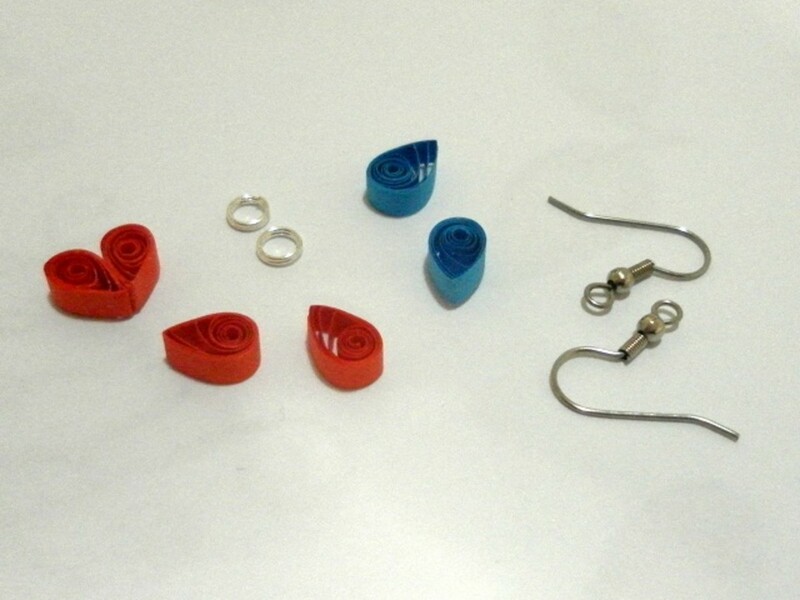 These are the tools and materials required to make one pair of earrings pictured on the right. 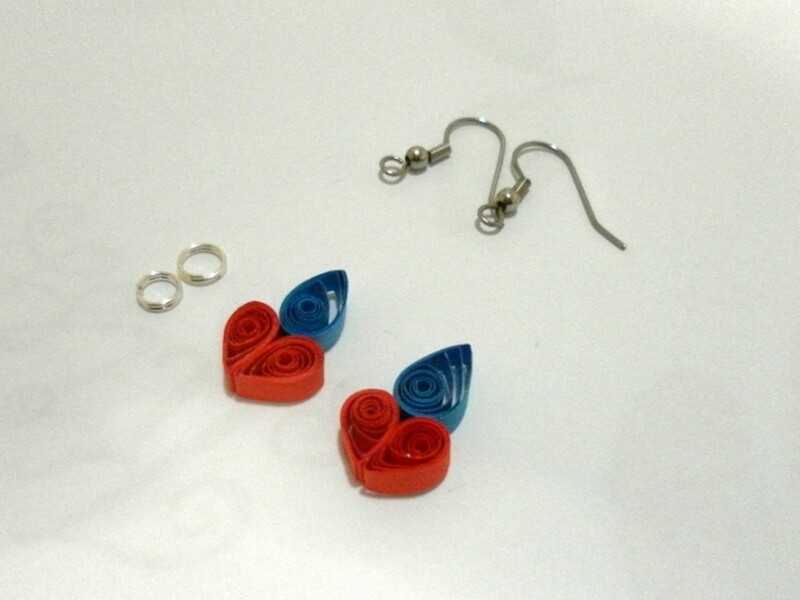 Make six closed coils with the blue and red quilling paper strips. 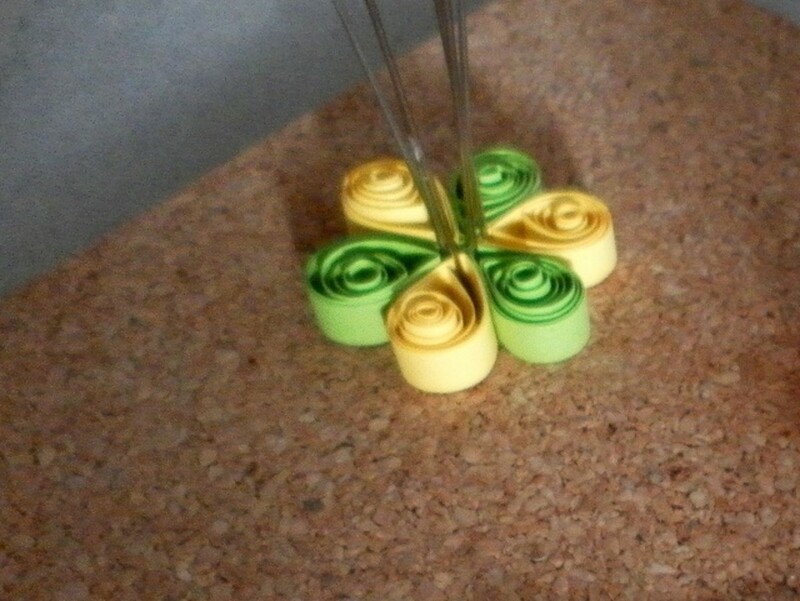 Shape each coil to form a teardrop shape. 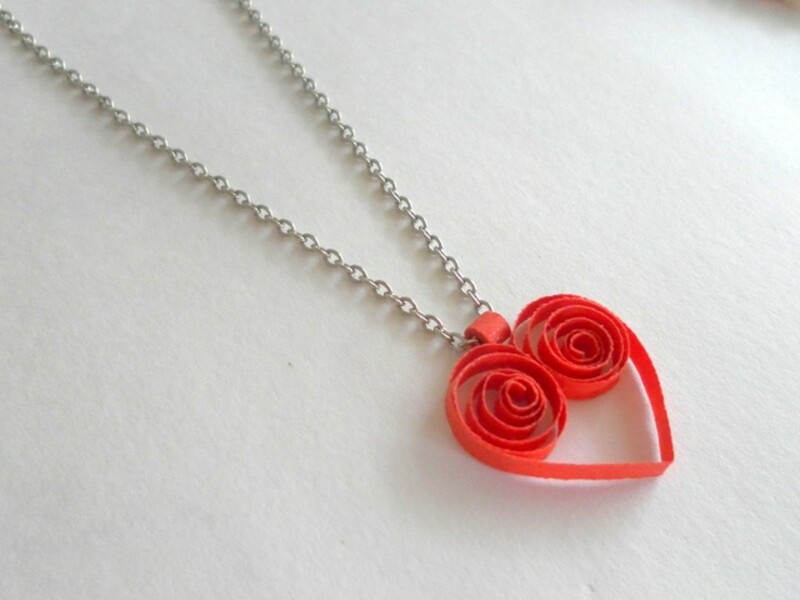 Take two red teardrop shapes and glue them together so that they look like a red heart. Then glue a blue coil to top of the heart. Repeat with the remaining three coils to make a similar formation. Apply clear varnish to the quilled items to strengthen them. Leave the coils to dry. 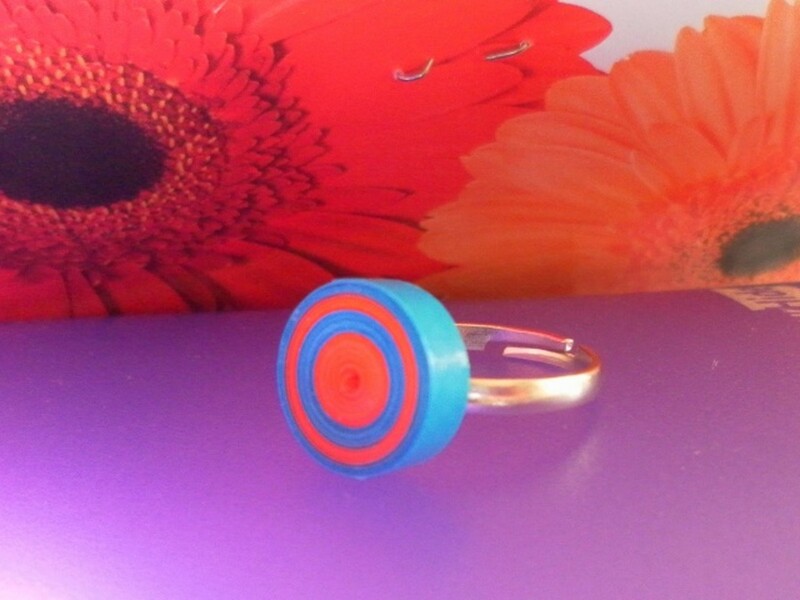 Insert a jump ring to the top of each of the blue coil. Then attach the earring findings to the jump ring to make the earrings. 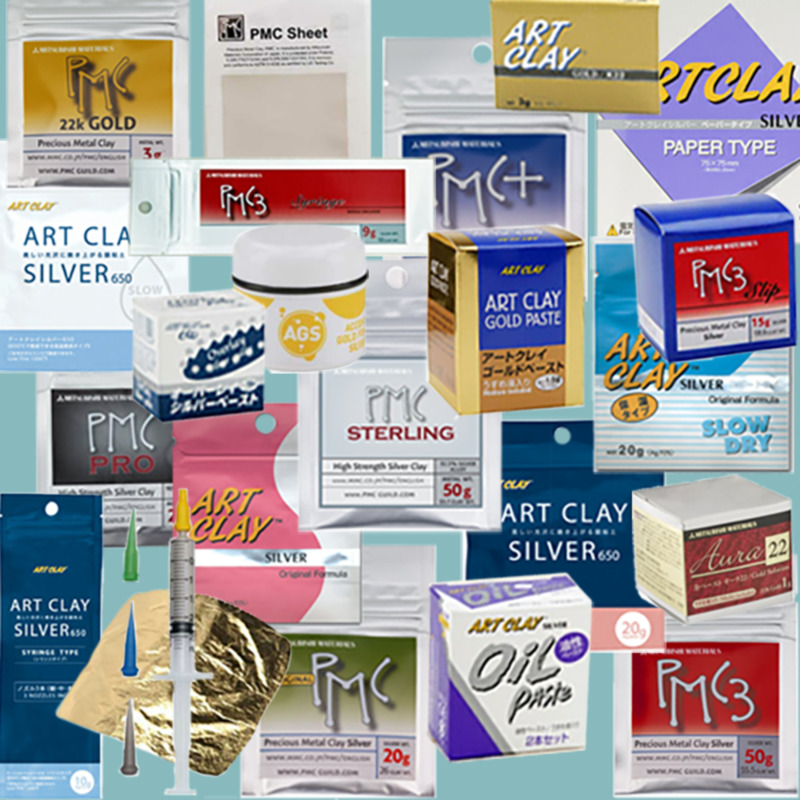 Here are the materials required to make a quilled pendant. 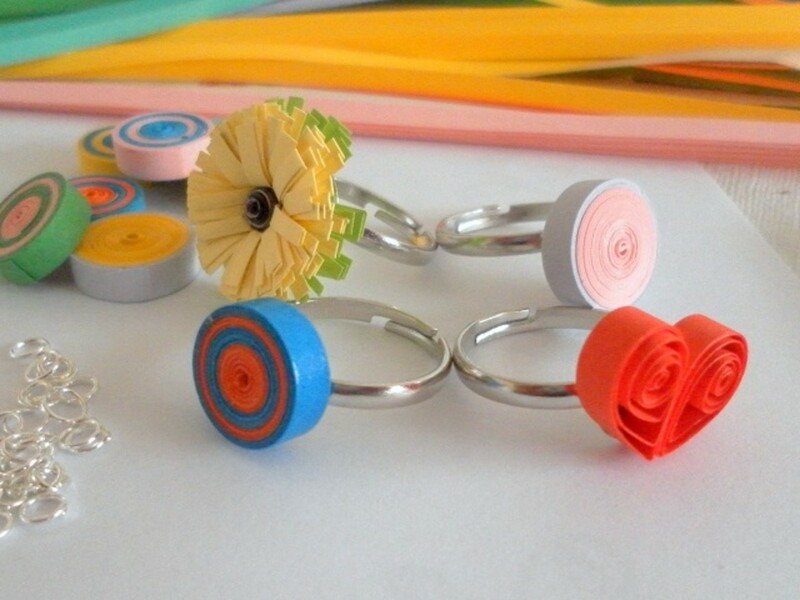 With the strips of quilling paper, make some closed coils of different shapes. Arrange the coils together to form a pattern for the pendant. Use pins to hold the coils in place if necessary. Apply a small amount of craft glue in between the coils so that they stick together. 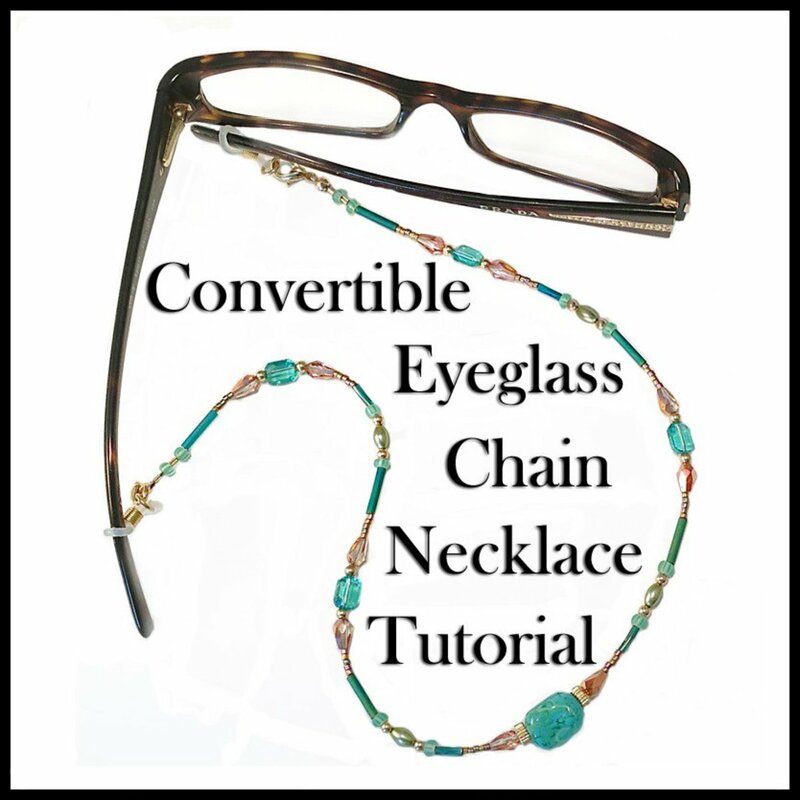 Apply two layers of clear vanish to the quilled piece of jewelry to strengthen it. 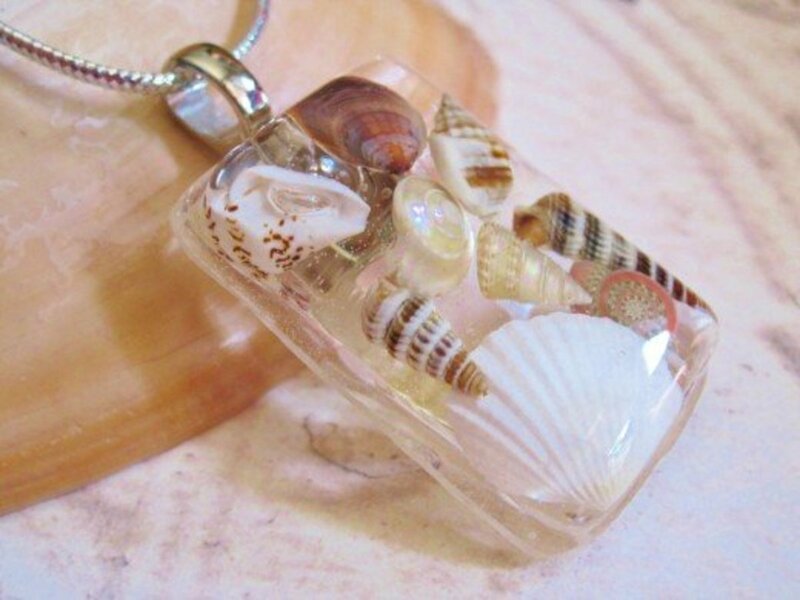 The coating of varnish also provides a waterproof layer for the pendant. Let the vanish dry before attaching a small jump ring on one of the coils. 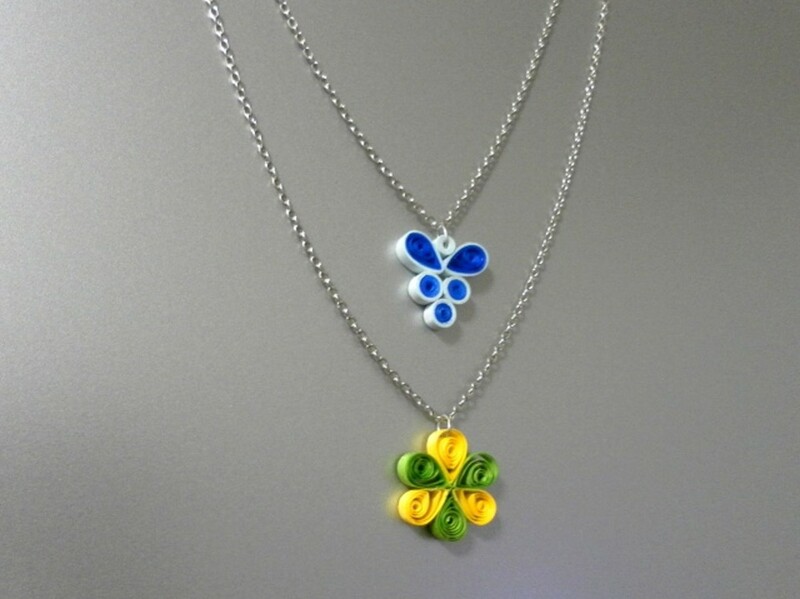 The quilled pendant is now ready to hang on a necklace. 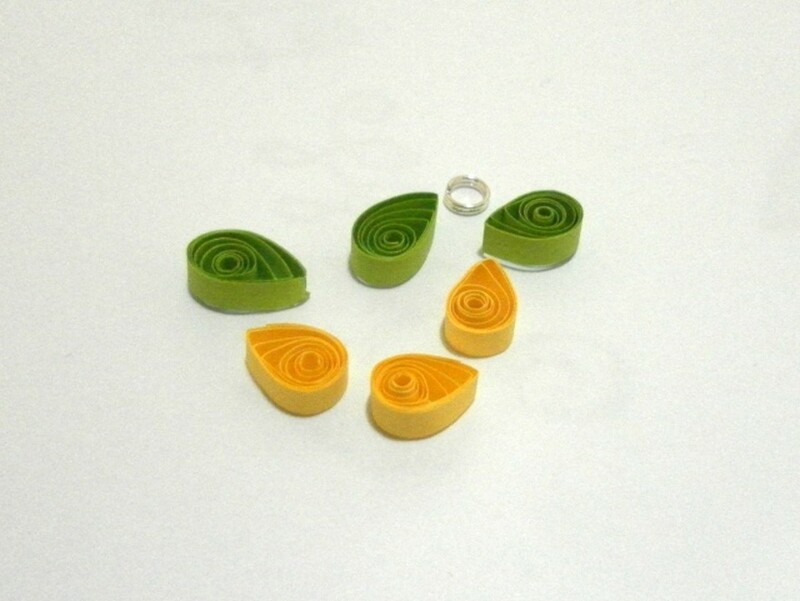 Join the five strips of quilling paper together to form a very long strip and then make a tight coil. The coil should have a diameter of about 12mm. Give the coil a coat of varnish and leave to dry. 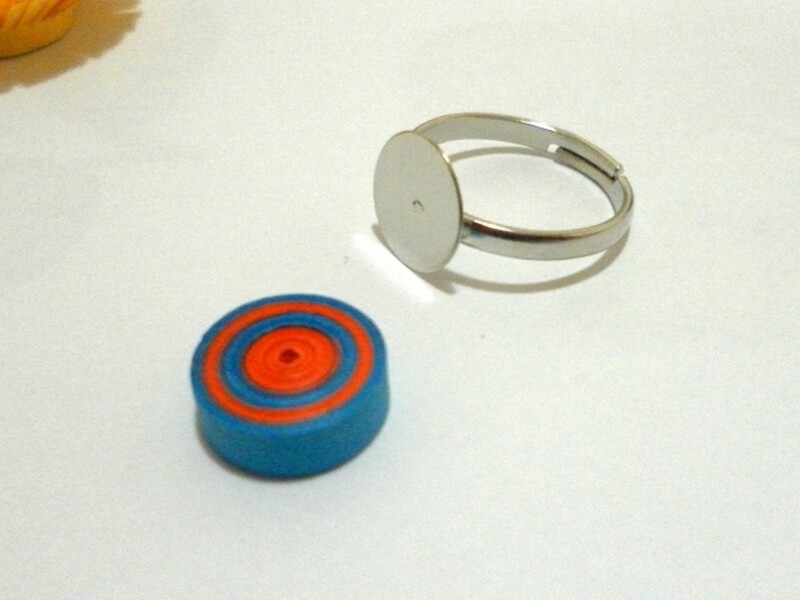 Glue the coil to the metal pad of the ring and let the glue dry thoroughly before wearing the ring. 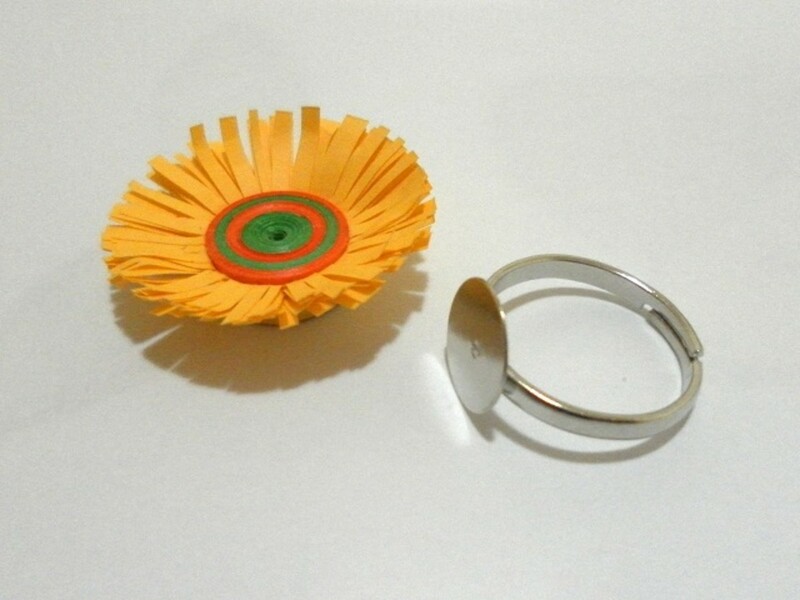 Make the coil as per previous instructions above for paper quilled ring and finish off the coiling with the strip of fringed quilling paper wrapped around the outside of the coil. Press the fringe down to form the fringed flower with a large colourful centre. 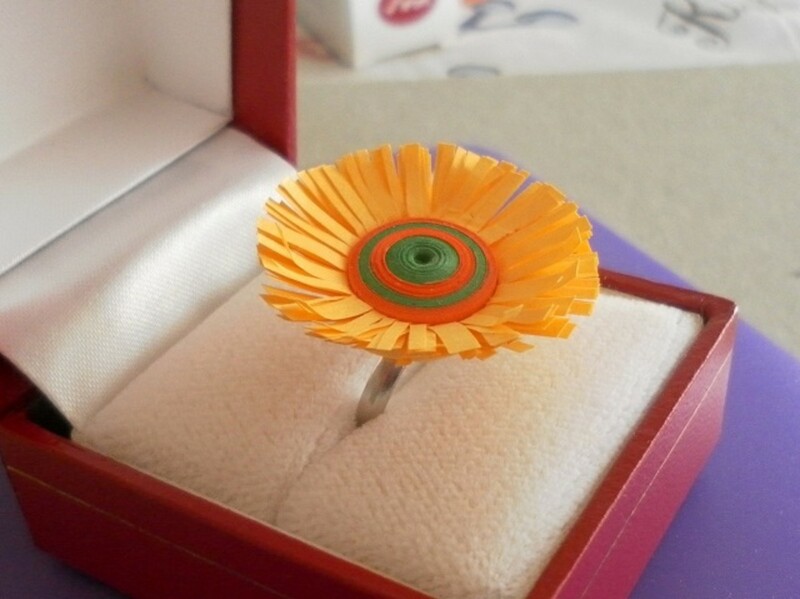 Glue the fringed flower to the metal pad of the ring base and allow the glue to dry thoroughly before wearing the flower ring. 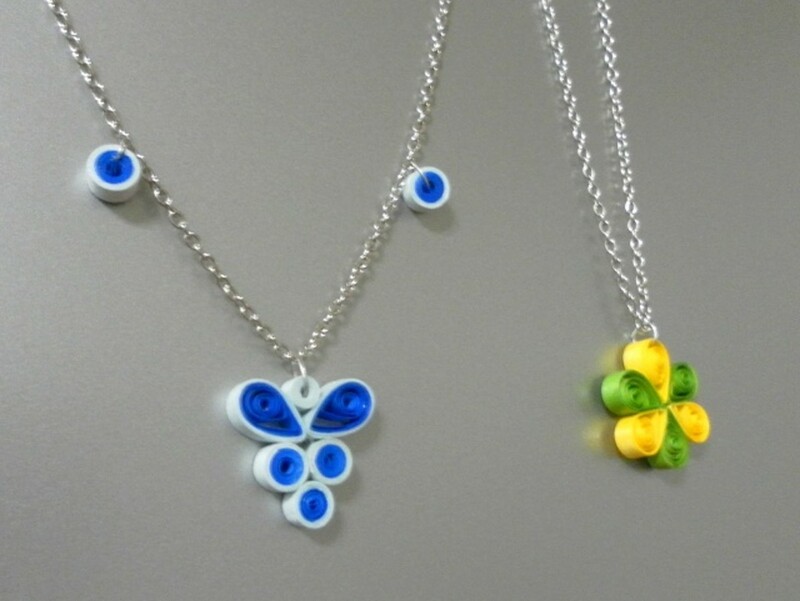 What type of varnish do you use for quilled jewelry? 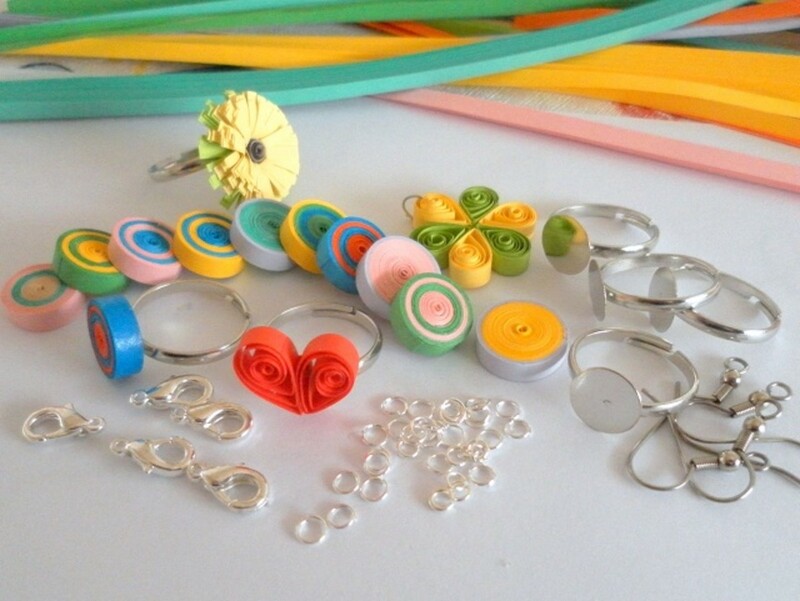 Craft varnish can be used on the quilled jewelry. I have fallen in love with u lady rain... ur creativity now keeps on popping in my mind and raining on my work board... really thanks... thanks a million ton... and ur detailed way to show things are really worthy giving a thanks for... thankyou again.... love ya. ;) thanks again. I loved it...its really so pretty. Its really very very good.I will try it. 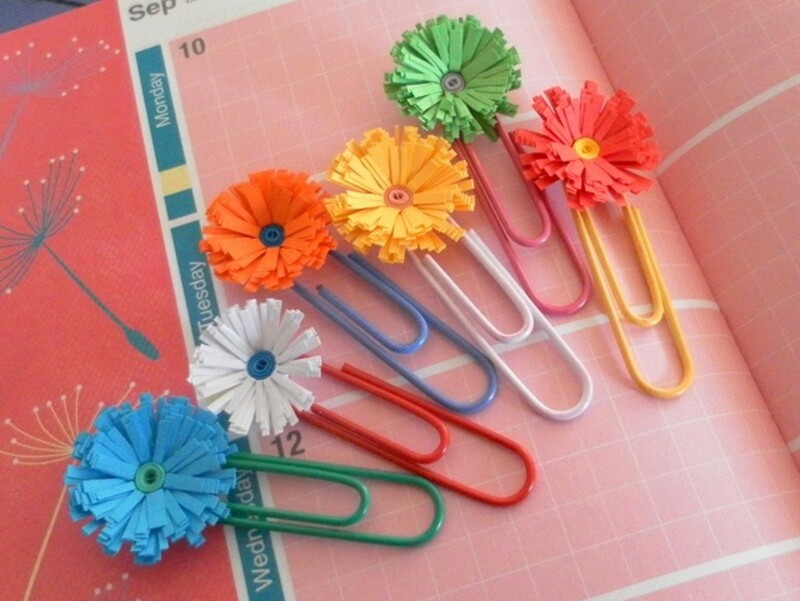 afeefa, if you can't find the craft supplies in your local stores, you can purchase them online from ebay or amazon.com. thanks a lot.. i have been searching for the coatind to apply on my paper quilled ornaments...some says about ppa glue, crystal coating.. etc... but i didn't find any of this from nearby shops..
Dreamhowl - yes, making quilled jewelry is fun. I hope you'll try to make your own jewelry soon! 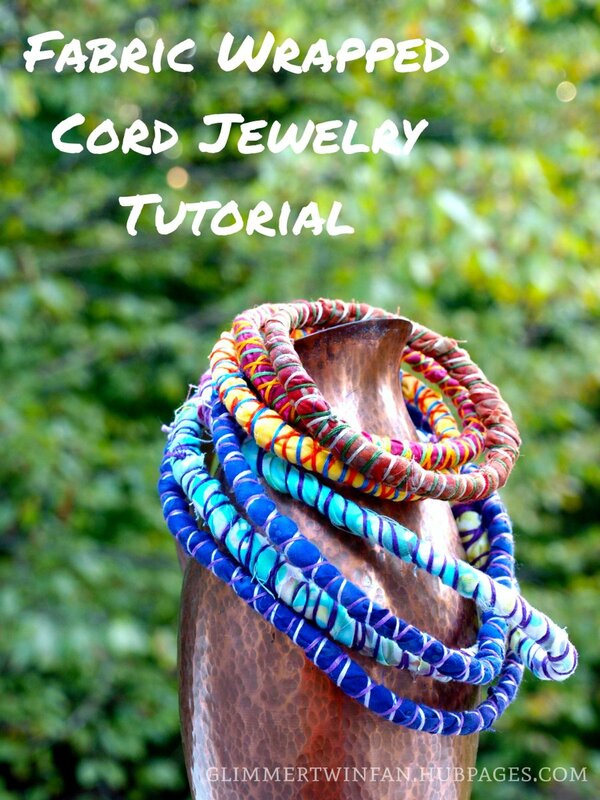 This looks like fun, and makes me want to actually try making jewelry. Thanks for sharing this - I'll have to give it a shot. pratheeksha, I'm pleased to know that you have made a pendant and a pair of earrings for your mom. I have no doubt they turned out really great! Thank you for leaving a feedback here. really wonderful, i liked very much and i have gifted a pendent and a pair of earrings to my mom on her birthday. Natashalh, I make a lot of the basic coils while sitting in front of the TV.. at least, I'm not wasting my time if the shows are boring! Very cute jewelry! Man, I really need to find the time to try paper quilting. 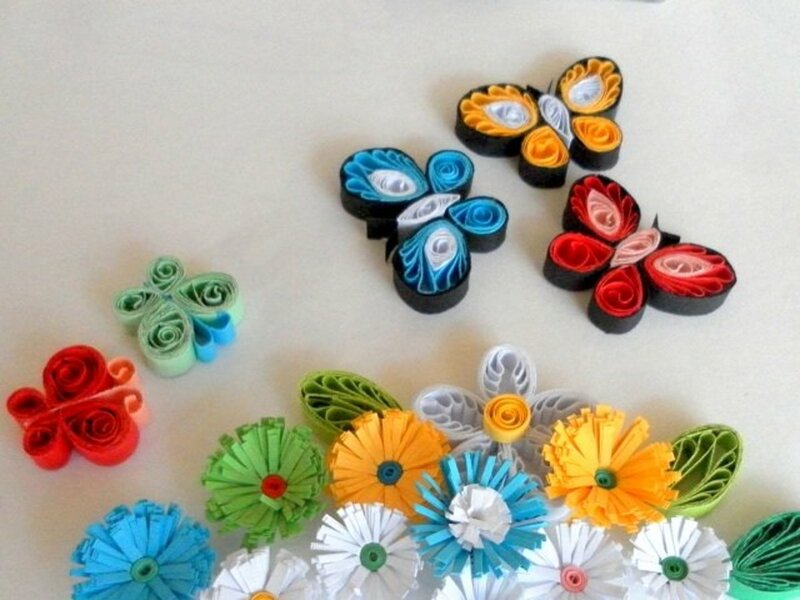 carol, paper quilling is a great form of art and craft to learn. I hope this hub gives you some new ideas to write on your other site. Cheers! This is something new to me. I have to say I find it really fascinating. I love crafts and write craft articles for another site. Thanks for sharing the information and excellent pictures. I haven't checked the links yet...just wanted to comment first. Hubpages is always an interesting place to "find" neat things to do.